terraNOVA Collective is proud to present the perfect collaboration between Broadway director Michael Leeds, indie record producer and sound designer Phil Palazzolo, and renowned actor and stand up comic Terri Girvin. Set during one chaotic shift at a bustling NYC bar, Terri pours drinks for her needy and quirky customers while fending off phone calls from her about to be homeless mother. Alone on stage, without a single prop, bottle, or glass, Terri’s entire world is created flawlessly through physical movement and an intricate, highly integrated soundscape. 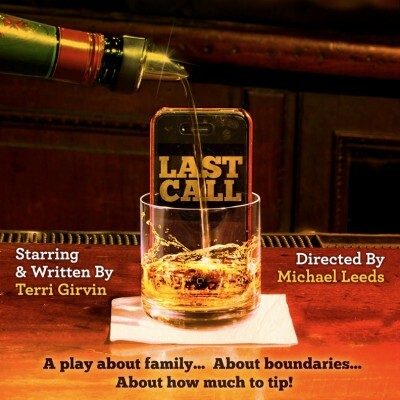 Based on real life experiences, stories and actual customers LAST CALL is an energetic play about family, about boundaries and about how much to tip. An incredible marriage between action, stand-up and sound it is a meticulously crafted and funny piece of theatre. PHIL PALAZZOLO (Sound Design) Most recently worked along side Tim O’Heir on the sound for “Hedwig and the Angry Inch” starring Neil Patrick Harris, Phil Palazzolo is primarily an indie record producer. Along with numerous other indie bands, he produced and engineered The New Pornographers albums Challengers and Together and his work with Neko Case has garnered three Grammy nominations, including Best Indie Music Album.